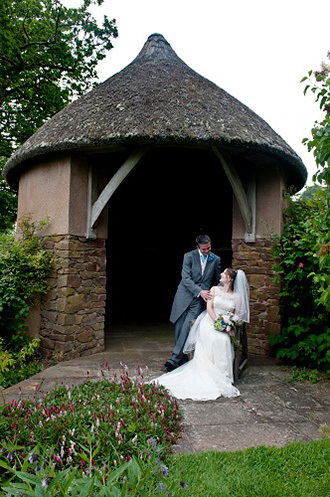 Fursdon nr Exeter hosts a very small number of special country house wedding receptions each year. Special because each one is unique. We ask that you use one of our preferred marquee suppliers but you can choose everything else for yourself. We just give you an amazing location with stunning views. You may want an informal party with hog roast and a disco or a formal dinner with a band. It's all possible at Fursdon and we will help you to plan and coordinate the day. You may choose flowers, bunting or balloons to decorate your marquee. You may want drinks inside historic Fursdon House or Devon cream teas outside in the garden. You may want to stroll off around the grounds with your photographer while your guests enjoy a glass of champagne in the Library. Come and discuss your special wedding celebration with us. We would love to hear from you to see if Fursdon is right for your special event. Please contact us using the form or e-mail us at admin@fursdon.co.uk.